Just as we are excited about transforming lives, our patients are equally excited to share their experiences with others. Our Crystal Lake Chiropractic team knows that outstanding reviews and quality of chiropractic care matter to new patients. 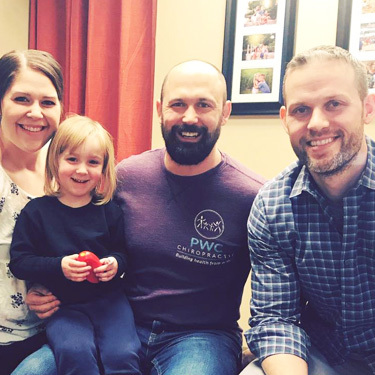 PWC Chiropractic invites you to see what our patients have to say! When we first met Kylan last year, he was struggling. He was having #meltdowns pretty much from the moment he woke up to the time he was ready for bed. It was hard for mom and dad because they hated to see their kiddo struggle. It was also really hard for them because there was no good way to discipline him. Kylan had a difficult time comprehending what mom and dad wanted of him. Kylan was also struggling with his #speech. He couldn’t comprehend what others were saying and he had a hard time expressing himself verbally. You could see the gears moving in this mind but he just couldn’t get words out. Kylan was chewing on everything and was seeking constant #sensory input from his environment. He struggled socially and emotionally. He wasn’t interacting with his peers at school or with his siblings at home. He had a disinterest in toys and books. He couldn’t calm himself down at night and hard a really difficult time sitting still. These struggles were beginning to affect not only Kylan, but his siblings. His parents were worried sick and incredibly nervous about what his future would hold. 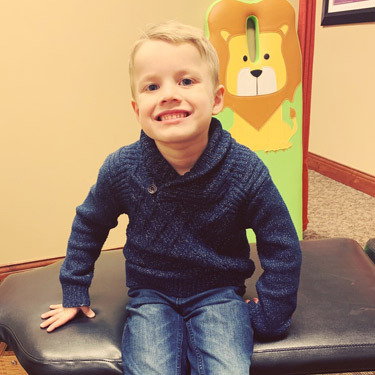 His teachers were reporting that he wasn’t improving on his IEP regardless of the extensive services that he was receiving in PT, OT, speech, and social emotional. Everyone was recommending evaluations for sensory, spectrum, anxiety, something. 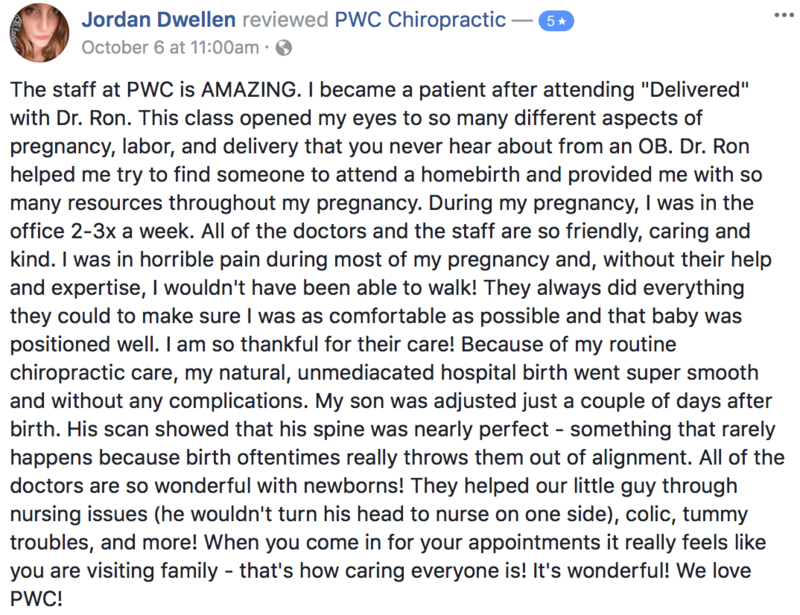 Mom and dad came to The Perfect Storm last year and decided to jump all in to chiropractic and PWC. And we are SO glad they did! Kylan is THRIVING. His speech and comprehension are getting better and better every day. He is hitting social and emotional milestones and playing with his classmates and siblings. His meltdowns have gone WAY down and when he does have one, he understands consequences and discipline. He understands compromise. Mom and dad just had an IEP meeting with his school a couple weeks back and they said he is making HUGE strides and is a completely different kid! Every day our office is filled to the brim with full families that come hang with us once a week to STAY well! This fam sees us together, all for different reasons. Mom is currently growing a baby and chasing twins at home! She stays well adjusted to help her handle mom stress + prevent the aches and pains that many accept as normal during pregnancy + prepare her body for the most optimal labor and delivery! Dad gets adjusted because he’s a busy guy that doesn’t like having to slow down! He wants to be able to work + chase after his babies + date his wife + work out without pain and an elevated ability to adapt! Those cutie pie twins get adjusted to ensure the most optimal growth and development as they get older! Although each family member comes in for something a little different, one common theme runs throughout: PREVENTION! Our healthcare system tends to focus on reaction rather than prevention most often. But so many of our families get adjusted regularly as a part of their wellness routine because they understand the ability chiropractic has on preventing so many issues in the first place! 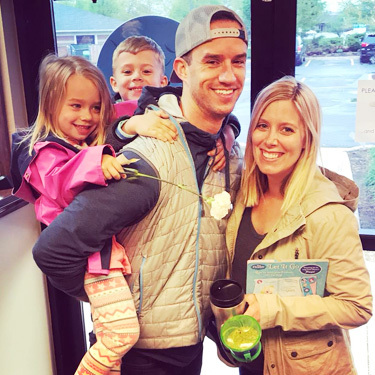 So fun to see our walls jam packed with wonderful families just like this one! And we can’t wait to care for the newest member of this fam once she is earthside! 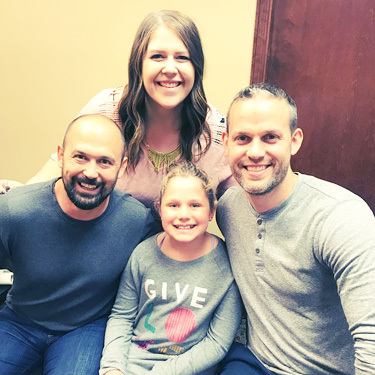 “All of my friends literally call this little girl ‘the miracle child’ because they saw her before chiropractic and now they see her after.” When Annie first came to us, she was having meltdowns and crying fits constantly. The family couldn’t go anywhere. Everything from a basic grocery store trip to a train ride down to the city was absolutely impossible because she would scream on the top of her lungs for hours at a time. Any time there was overstimulation or frustration of any kind it would end in a meltdown. It was clear that Annie was not comfortable in her own body and couldn’t interact with the world around her. Grandma didn’t know what to do to help Annie. She was at a loss. 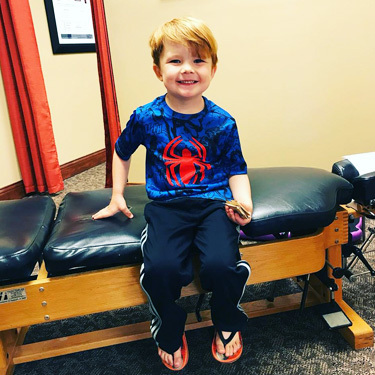 She has never heard of chiropractic helping kids with anything more than back pain, but she took a chance and showed up. It took Annie a little while to unravel and reconnect. She liked getting adjusted but wouldn’t even say hi to any of the doctors for a long time! After a few months of consistent, specific, neurological-based care, Annie’s family began to see glimpses of hope. The extreme highs and lows began to level out a bit- more good days than bad ones. Meltdowns became shorter, then disappeared. Now the family goes out into public without a care in the world! Grocery shopping and errands are done with ease. In fact, after this picture was taken, grandma told us they were boarding a train down to the city and she knew she had nothing to worry about! Expect miracles. They happen every day within these walls when kiddos are given the opportunity to connect, calm, and live life how they were intended! 49 is the number of days Nevaeh missed from school last year. She would wake up in the morning and be so overwhelmed and anxious to go to school that it would often times result in tantrums, meltdowns, and calls to the school office that they would be late or not be there at all. Nevaeh would go through her day defiant, impulsive, and anxious. Anxious about change. Anxious about transitions. Anxious about any potential shift in schedule or routine. Bedtime would approach and that anxiousness would continue as she would be so nervous about having to get up and go to school again the next day. On top of this tremendous amount of stress, Nevaeh was struggling with constipation and GI issues as well as constant immune issues requiring very frequent doctors visits. She also struggled with sleep because her brain just couldn’t shut off at night. This cycle continued until grandma couldn’t take it anymore. Nevaeh was put in 2 partial hospital programs and then 1 in patient program for school anxiety, generalized anxiety, and school refusal. Regardless of these programs, trying medication after medication, and therapist after therapist, they listened to a friend and called us at PWC. 5 is the number of weeks Nevaeh has gone without missing ONE day of school this year so far! School refusal and tantrums are a thing of the past. Changes in schedule and routine are easy for her. Immunity is rocking- they haven’t been to a doctor since they started! Constipation isn’t an issue, and neither is sleep. Nevaeh no longer has to be primed and prepared and reminded for hours upon hours on Sundays about school on Monday. This isn’t to say that days don’t come with a bit of frustration, but Nevaeh can now EXPRESS those frustrations and emotions! She’s also forming friendships and connecting with her peers in a way she never has before! 1. 1 more kiddo saved. 1 more life changed. 1 more family filled with joy. 1 more smile. Look at that smile?! The smiles are everything. Meet James. James is going into 8th grade next year as a calm, connected, healthy kid. But the last 9 years of his life came with a whole bunch of struggles and what mom refers to as a time filled with hopelessness and isolation. He was diagnosed with ADHD when he was young. So like most, they tried medications. Not just one, but five. The first one caused uncontrollable eye twitching. The second one caused suicidal ideation and resulted in this small boy telling his mom he no longer wanted to live. The third turned him into an aggressive, mean, angry kid. A combination of the fourth and fifth allowed him to focus in school but caused him to stop growing for 3 years and completely lose his appetite. At this point mom said “I didn’t even know what each medication was doing anymore. It just all seemed part of the cocktail.” James had been kicked out of 2 therapeutic day schools in the past and his current school was telling mom that they didn’t have the resources to handle him. Mom was lost. She was terrified. She was fed up. While scrolling the internet and stalking mom groups on Facebook searching desperately for an answer, she was guided to The Perfect Storm webinar that Dr. Tony did. She didn’t know she was searching for chiropractic but she heard James in every word he said. It’s been a process and a journey of highs and lows but the boy you’re looking at in this photo is medication free, has gained 10 pounds (and mom can’t seem to keep enough food in the house! ), is getting along with his peers better, and he is calmer and more connected than ever before. Mom feels HOPE again. Something she hasn’t felt in 9 years. And James is living life in the fast lane! He loves to read books (something he has hated since 3rd grade! ), swimming, and is training for a triathlon! Oh, and he never wants to stop getting adjusted. Chronic ear infections. Pneumonia over and over again. Constant fluid in his sinuses + ears + lungs. Mild to moderate hearing loss. 6 different antibiotics in 5 months. Breathing treatments and nebulizers. ER visits regularly. ENT visits that strongly recommended ear tubes and tonsil/adenoid removal. A mom that literally knew NO different. She didn’t know what else to do. She hated the idea of surgery but just wanted her child to be what every parent hopes for: healthy and happy. Developmentally, she knew his letters and sounds and words were delayed because of the hearing loss. Physically, she knew he was constantly miserable. Emotionally, she knew he was a wreck because he just wanted to feel better. A pediatrician that was willing to recommend a different approach. Another way. 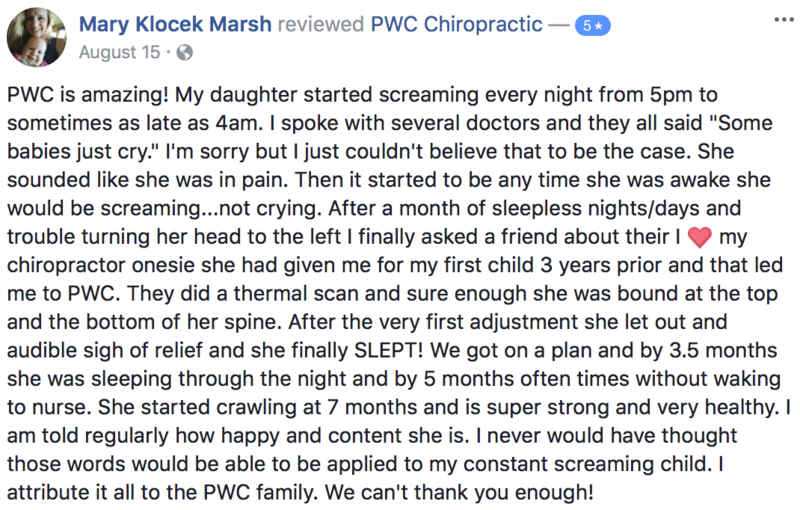 “Try PWC Chiropractic” she told mom. Mom came but was weary. “I’ve never heard of this before…why would it work? Someone would have told me earlier.” With her arms up, ready to pull her hair out, she brought him. A double ear infection (one bulging ear drum on the verge of bursting) after being off of his previous round of antibiotics for 4 DAYS left her willing to try anything. That was the last time this little guy was on antibiotics. Never again has he needed one round. Never again did he need an ER visit or an ENT referral. Never again did he need a hearing test (because it’s been fully regained!). Never again did mom have to worry about his physical, emotional, or developmental well being. He is HAPPY. He is HEALTHY. Mom desperately wanted to share his story in a big way. She longs for everyone to know what she now knows. That there IS a different way! Parents, you all deserve to know. I can not say enough good things about premier wellness and all of the doctors and staff. At 29 weeks pregnant I have been in pain and not sleeping. After just one adjustment by Dr. Ron my hip pain has nearly disappeared. Also, I was able to kneel down to give my two year old a bath pain free for the first time in months. I am very excited to continue treatments through the end of my pregnancy and beyond. From the moment I called to make my appointment, all the way up until I left my appointment, everything was fantastic! Extremely nice people everywhere, and not the fake nice kind :-) Very genuine and explained things in a way that anyone could understand. I look forward to my future appointments as well as those for our baby, once he/she is born! Thank you for the patience and compassion shown to me and both of my kids! Everyone made us feel so taken care of and important. All of the staff were warm and kind. I especially appreciated the time taken to orient us to the practice and efforts to make us feel welcome! Hearing Dr. Tony’s “Perfect Storm” presentation for the first time made me think about my son’s body on a much more foundational level. The nervous system controls everything, absolutely every system, organ, tissue, etc. If the nervous system was not functioning optimally, then everything else we were doing couldn’t have the greatest possible impact. We immediately started getting my son adjusted several times a week. It helped his headaches, his digestion and his hyperactivity. 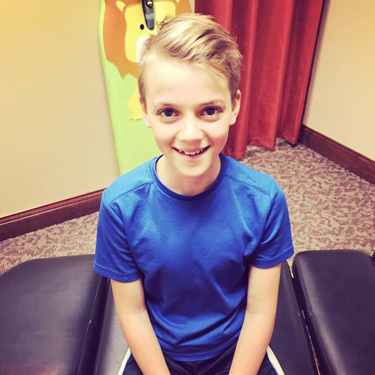 Chiropractic adjustment quickly became a super important tool in our arsenal to treat his many issues. We can do so many great things for our bodies with appropriate dietary choices, targeted supplementation, regular exercise, good sleep, etc. Chiropractic care sets the body up to really make the most of those things and maximize our health. It is the foundation. It sets the stage for optimal health. Ready to begin your own story? Let’s talk. Call our Crystal Lake office today.